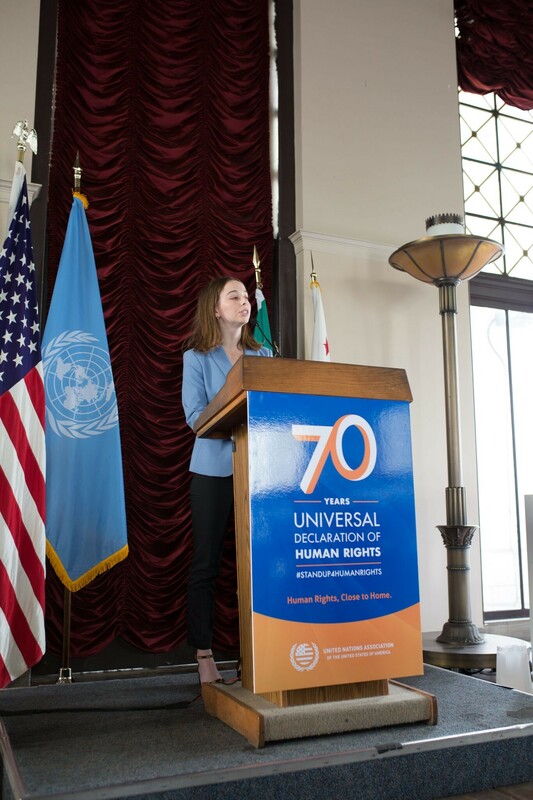 In December, Sophia R. ’20 made her way to Los Angeles City Hall to speak (watch the video here) before a panel of community and global leaders on her proposed solutions to gender inequality. 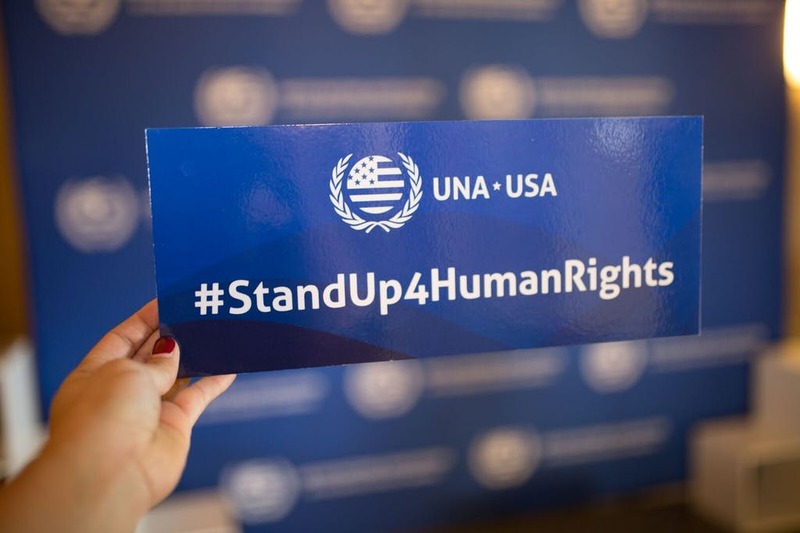 The speech was for the first-ever Youth Solutions Summit, hosted by the United Nations Association of the United States of America (UNA-USA) to celebrate the 70th anniversary of the Universal Declaration of Human Rights. Five high school students were selected from a competitive pool of young advocates to serve as Human Rights Youth Ambassadors and present their original solutions to human rights challenges facing the Los Angeles community. Sophia had 5-10 minutes to pitch her proposed solution to the panel, which included Monique Coleman (actress and UN Youth Champion), Jason Collins (retired NBA player and the first publicly gay athlete to play in any of the four major North America pro sports leagues), Dolores Huerta (civil rights leader and co-founder of the National Farmworkers Association), Shawn Kravich (executive director of the Snap Foundation), and Ford Roosevelt (president & CEO at Project GRAD Los Angeles). LA City Deputy Mayor for International Affairs Nina Hachigian and UN Deputy High Commissioner for Human Rights Kate Gilmore were also in attendance. “I think policy change is important, but I really wanted to focus on a grassroots approach so that my solutions feel like they’re within reach for the Los Angeles community,” remarked Sophia. With that in mind, she divided her topic into three main points, calling for more all-female educational environments (particularly for STEM subjects); focusing on the link between domestic violence and financial autonomy; and encouraging participation in more discussions around gender equality. Inspired by a recent positive conversation with her father about the Time’s Up movement and #MeToo, she encouraged the men in the room to ask questions of the women in their lives and listen to them explain their experiences. That final point did not go unheard, as one audience member approached Sophia after her speech to tell her that he planned to go home to his 13-year-old daughter and talk to her about gender inequality. During her opening remarks at the summit, Ambassador Nina Hachigian said, “We in Los Angeles understand that diversity in thought and representation is critical to finding innovative and effective solutions to our city’s toughest challenges.” After their speeches, the five Youth Ambassadors led 30-minute roundtable discussions with other students in attendance on the intersectionality of the issues discussed at the summit (LGBTI+ equality, poverty and homelessness, immigration, technology for social good, and gender equality), stakeholders in advancing human rights, and how the LA community might look in 2030—an activity that truly highlighted the value of including youth voices in dialogue about social justice. Watch Sophia’s speech at the summit here (starting at 35:00). Images courtesy of United Nations Foundation and Laura Rubbo.